We took a slow boat (or perhaps one could call it a junk) up the Mekong from Luang Prabang to the Thai border. We’ve seen several faces of the Mekong now. First, we took a longboat around Mekong Delta in Vietnam, where a branch of river meets the sea. Then we stayed on the stylish Mekong riverfront in Phnom Penh, Cambodia. Vientiane has a more laid back waterfront on the Mekong. And now we’ve journeying through some beautiful rolling hills and craggy rock formations in Laos, seeing occasional fishermen or gold panners on the way. We stopped at "Whiskey Village" yesterday, and saw how they distill fermented rice into high-proof firewater. We tried some of it — smooth. And we breaked at Buddha Cave, a vertical limestone cave in a riverside cliff, that the devout have filled with Buddhas for centuries. We overnighted at a beautiful lodge at the halfway point, that seems fairly socially responsible. The staff was incredibly nice, and we had a fun evening with some of our shipmates. The next morning, the fog over the hills was pretty and reminded us of Ireland/Oregon. We had some really great sweet rice candy wrapped in banana leaves with our tea. And sat around doing nothing but watching the scenery and reading books. Off the beaten path. Sort of. My shins hurt with every step. And I may have a minor sunstroke. But it’s worth it. We went on a trek through mountains surrounding Luang Prabang to see lush scenery and hill tribe villages. Our wonderful guides, Doua and Buonsu are Hmong. We started by taking a long boat down the Mekong to Seaweed Village, inhabited by a Lau Loum group. A few people greeted Doua as we walked through. And we saw how they make khai paen, a nori-like dried river moss that we’d sampled in Luang Prabang. On the outskirts of the village, three boys and several excited dogs ran past us. Doua explained they were hunting mice with slingshots, for dinner. Continuing through forest, we climbed a few hills. The trees thinned out, and we climbed some naked hills in the muggy heat. The afternoon sun was sweltering, and my pasty northern skin was failing me — I was ready to keel over. Doua and Su were untiringly patient. We lunched at a Khamu village, in a rickety wooden schoolhouse. The tour company had packed baguette sandwiches for us, but fortunately, Doua and Su were willing to share their delicious sticky rice and smoked-fish-on-a-stick. Sticky rice is the staple food in Laos; and you make little balls of it and dip them in your food. I love it. As we ate, children started trickling back from lunch and looking at us through gaps in the wooden walls, shouting "Sabidee!" (hello!). They were shy about approaching the "falang" (foreigners), but very intrigued. They see falang about three times a week, but apparently we’re still novel. An elderly gent from the village came to visit us, and remarked how our hair and skin were different from the French (we didn’t bother explaining there are French Americans). The kids lost their fear when he came in, and crowded around us. After lunch, we walked through town and saw the pigs and chickens in the shade of the local stilted homes. A family of cows posed. And the call of "Falang! Falang!" rang out as we strode through town. We continued to climb, sweat-soaked (me and Jason at least), in the blazing heat. After hours of seeing no one, we passed a family of three Hmong in traditional dress, including a girl of about ten. The man was wearing long culottes. They hopped effortlessly down the hill like mountain goats, as we dragged our carcasses up the scorched earth. It was nearly 100 degrees out. A couple hours later, the scenery was greener and the vistas more grand. We were enjoying the shade. In the distance, the earth was dimpled on a grand scale with fuzzy green mountains and valleys. A tall, jungle-covered mountain loomed in the distance. "My parent’s village is on the top," said Doua. That’s him on the right, with Su. The plan was to overnight at his parent’s home. It looked far away. And I didn’t realize the village was on the other side of the mountain. It was probably just as well. We pressed on, up and down a few more hills. Then it was time to climb Phou Luang (Big Mountain). It looked like a daunting task, and the sun was starting to set. Surprisingly, climbing the mountain was actually quite manageable, and turned out to be one of the nicest parts of the trek. 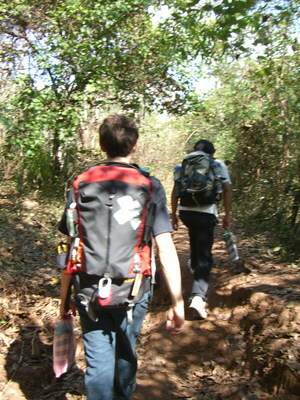 We scaled steep red dirt trails through the jungle, in the shade. Occasionally Doua or Su would point out a stunning view, a lizard, or a special plant. Now and then they’d point out rice fields farmed by this village or that one; sometimes Dou’s village. They knew exactly who planted rice where, and which year. The Hmong still employ slash and burn farming. With some elbow grease, we made it to Doua’s village, Phou Luang Tai, by sundown. We were now at 800 meters above sea level — we’d climbed 600 meters up. Our sunset view of Phou Luang Tai was magical. Brown thatched roofed homes on hard sloping brown dirt bordered by jungle, in the fading orange light. The whole village has panoramic views of the surrounding rolling green mountains and valleys. You can see three or four layers of mountains in the direction of Luang Prabang. Phou Luang Tai is a very traditional Hmong village, and has no electricity or running water. The inhabitants are basically all subsistence farmers who live on one rice crop per year and raise a few animals and vegetables. We walked a few feet down the hill. Doua’s parent’s house was the first we came to; it was a one-room, rectangular wooden house with a thatched roof. We stepped in and everything was pitch black — our eyes hadn’t adjusted. All we could see was an orange fire on the earthen floor, and a little oil lamp in another corner. After a few minutes, more details came into focus: a large vat of hog food for the next morning, two slatted beds across the room, cooking utensils and baskets hung above the fire, a wall calendar, a rectangular plastic basket hung from the wall. Doua’s mother, Soua, was tending the fire. We walked across the room, and out through the home’s other door, to sit on the bench outside. We were exhausted. Soua came out and gave us some of the local mini bananas to eat. And his father, Churlue, came and showed us how his cheek was swollen from a toothache; I hope he gets to a dentist soon. Both were dressed in traditional Hmong clothing. In some less isolated villages, where western tourists are common, locals often wear western clothes like tee-shirts on a daily basis, and change to traditional clothing when the tourists visit. But this village is still old-fashioned, and they wear traditional clothing everyday. After the sun set, we could still see much of the village by moonlight. It was such a special experience. We followed Dou down the hill to the rest of the village; the scale of things was a little surreal — being on a mountain-top and hopping down a steep hill on packed, furrowed earth amongst thatched homes and wandering farm animals. It was so much fun. We heard the lowing and squealing of animals in the dark, and our flashlight picked out two adorable goat kids. Doua led us to a spot where we could see the bright lights of the "big city." You can see Luang Prabang from Phou Luang Tai, though it’s over a mountain range. On the way back to his parent’s house, we encountered sleepy cows. Back in the house, sitting on low stools ’round the fire, we shared digital camera photos, enjoying the juxtaposition between ancient and modern. A friend of Doua’s joined us at the fire. And Su told us about the extremely long process it takes to prepare the rice we were about to eat. Soua tended the ancient pots over the fire. And Doua’s parents have a little cat to keep the mice away from the rice — I broke my rule of not touching animals in Southeast Asia to pet her. It was comforting to sit by the warm fire, scratching the cat, talking to friends, with Hmong music on the radio. While we sat, Doua’s parents set up a table for our dinner, complete with tablecloth and candles; they had to carry the table in. I don’t get the feeling they go to this much trouble for dinner when it’s just them, so it was very sweet that they took the trouble. We ate some of his parent’s rice, which was delicious. And Dou had prepared a lovely beef, vegetable noodle dish for us. The cat was demanding a handout from Jason. I asked Dou what her name was and he said "black cat with orange and white." I guess they don’t name animals. It was time for bed. We brushed our teeth by the bushes behind the house. And used "nature’s toilet." We climbed into the slatted bed Dou’s parents made up for us, across from where Doua and Su were sleeping. His parents were sleeping in a small bedroom carved out of the big room. It got cold and I was glad I’d brought layers. Lying in the smoke-filled room, animal sounds lulled us to sleep. At dawn, I was awakened by anxious squealing. Across the room, with blurry vision, I could make out a porcine silhouette against the glaring daylight. The hogs were hungry. Wandering around in the morning light, the village was a baby animal bonanza — cute piglets suckling, chicks and chickens in the feed trough, cuddly goat kids. Doua’s parents also had a small horse in a small, rough hewn cage — their transportation. Doua took us the (relatively) short distance to the peak of the mountain, though I stopped a bit short of it. He gave us some "Hmong cake," a heavy glutenous rice cake, to eat on the way up. He explained that the American army had removed the shells from the ground, so it was safe to walk on the hill now. As none of this had occurred to me beforehand, it might have been best for him not to mention it at all. Laos is the world’s most heavily bombed country, thanks to the US; shells still explode daily in some regions. The view was nonetheless beautiful. We returned to the village. Breakfast was rice, bread, eggs, Laughing Cow cheese and coffee. Although he didn’t speak English, Churlue wasn’t shy, and encouraged us to eat with the expertise of an Italian grandmother. He pantomimed that we should have big full bellies to have enough energy for the trek, and that you didn’t want to have a hollow empty belly. He was proud of his family’s rice and kept serving up more. Later, we interacted as he inspected some of our equipment, and it was fun to show both his parents the photos on our digital camera screens. Churlue gave us some small Lau bananas for the journey back. We walked through the village on our way out. Many of the homes are vacant, as several families move to Luang Prabang each year, looking for a better life. It’s sad to see their customs changing, but their way of life is so difficult, one can understand they would want to improve it. The villagers only get one crop per year, as their steep hillside rice fields don’t lend themselves to irrigation. It’s not enough rice to turn a profit. We feel lucky to have seen the village the way it is, as it will probably be gone in the next decade or two. A few houses down the hill, we saw one of the rarest things we may ever see. Inside was a shaman in a trance, a piece of black cloth over his face, moving his leg up and down like it was pumping a treadle on some old fashioned sewing or weaving machine, to the beat of a drum. Doua explained the shaman goes into a trance sometimes to help solve a problem; perhaps someone was sick. I’d never seen anything like it. The next house had some green leaves nailed over the door. "That house is taboo," said Doua. When someone gets sick, they try to reduce contact so others don’t contract disease. Near another house, men bent slats of bamboo into baskets and chicken cages while small children played around them. We walked past a man stroking a rooster on a leg chain — bait for wild birds he’ll shoot in the forest. Doua showed us his old school, and we met the grade school children who were shy, yet curious about us. They really enjoyed seeing pictures of themselves on the cameras. We started our descent; it was much easier than the climb. There’s another Hmong village, lower down the mountain, called Mok Pa Lai, where we saw a few families and animals. One of the cute kids in the village. Doua picked up a puppy; he loves animals. He can’t bear holding a chicken while someone else kills it. Jason likes puppies too. As we descended, Su was singing. During a break, his eyes were sparkly. He told us he’d met a girl in Dou’s village. It was cute — he was singing all the way back to the Mekong. The trek back to Luang Prabang was much more enjoyable than the previous day. There was more shade, and more variety in the landscape. God we looked haggard. At one point, we stopped at a little waterfall — a rocky grotto with a couple little rivulets. There was a rough-hewn cistern above it carrying water to the nearby village. Jason and I swam for a while in the icy water, and climbed on the rocks. Then four small kids arrived and swam with us. We walked through dry rice paddies to nearby Ban Some (Suitable Village), a Lau Loum village. The rice paddies were irrigated, creating two harvests a year rather than one. The village looked noticeably wealthier than Phou Luang Tai, and had running water — that extra crop makes a lot of difference. We had lunch there. The rest of the walk back to the Mekong was easygoing — we forded a few small rivers, crossed some rice paddies, walked through forests and down roads, and encountered travelers from various villages. I held a tiny tadpole at one stream; a glossy black centimeter-long demi-frog with legs and tail, jumping around on my hand. And this is a spot where they grow local watercress on the river. Turkeys puffed up as we walked through Hoy Pong, a Khamu village. The next village, Nam Boua, a Lau Loum village, had running water and electricity. It had two crops per year and was located next to a road, making trade more a possibility. It was interesting to see the progression from subsistence farming with one crop to irrigated farming with two crops and a road. The houses were sturdier, and the people are wealthier. We even saw a progression in the schoolhouses — from small, wooden and thatch-roofed to larger brick structures. Finally back in Seaweed Village, Doua found a boat to take us to Luang Prabang. We were proud we’d finally gotten off the backpacker trail, and hadn’t seen a single western face for two days. Luang Prabang has a night market, as many Southeast Asian towns do. There are lots of Hmong crafts and textiles, hippie skirts for foreigners, and wood carvings. Each seller has just about the same merchandise… except one. There’s an older lady there selling some truly bizarre stuffed animals, unlike anything else at the market. She doesn’t speak much English, but giggles a lot and points at various creatures saying "Lucky, lucky, lucky!" Outsider art or too many cheek-fulls of betel nut? I’m not sure, but I love them. A Japanese couple who were also admiring her handiwork seem to have the same appreciation as me. While I admired "Devil Riding White Tiger," they fondled "Bearded Mystic in Psychedelic Plaid." Ultimately, Devil and Tiger came home with me, as well as "Trio of Maimed Snakes" for my sister. Garbage cans in Luang Prabang consist of handsome pots that recycle old tires. Someone has literally cut up thick old tires and bolted them into these vessels, complete with handled lids. They sit on clever stands made of smaller tires. What a great way to be environmentally friendly while creating something useful, and more beautiful than standard garbage cans. We really enjoyed this set of cartoons distributed by Lao’s government, on the subject of respectful behavior for tourists. The cartoonist is Lao, and he’s completely nailed the "hippie backpacker dude" with scraggly hairstyle and earrings, and his hard-partying girlfriend who wears tight lowriders and tanktops into wats. As you can see, they’re demonstrating everything you shouldn’t do in Laos.